Once the AIA granted its (long-overdue) Gold Medal to Julia Morgan, in 2014, describing her as “the first great female American architect,” we decided to devote our 2015 programs to the San Francisco architect’s work. For our spring offering, trying to contain our range geographically, we decided upon San Francisco’s Chinatown, where Morgan designed buildings for the Chinese-American community. Anticipating a great response, we scheduled the program for May 30 with a repeat on June 6. We were fortunate to engage historian and retired architect Philip Choy, who generously agreed to lead the identical tour on both dates. 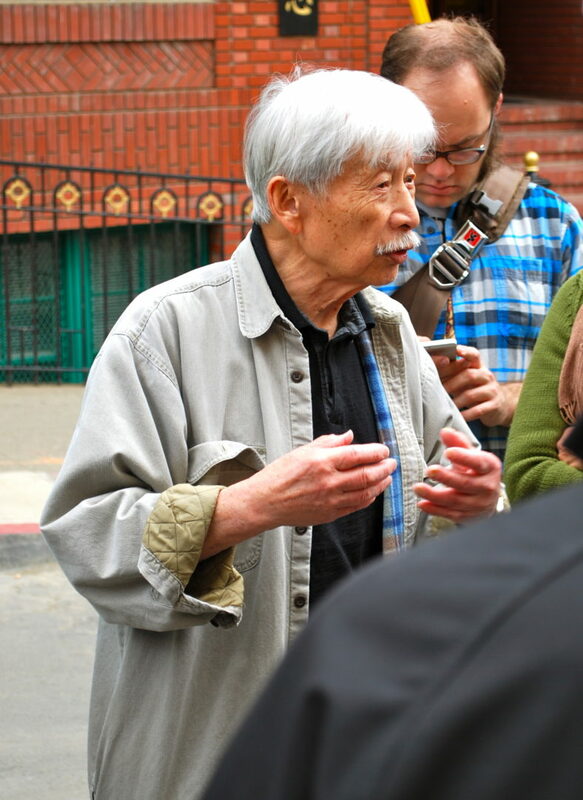 His well-informed commentary on Morgan’s buildings, the Chinatown institutions she served, and the larger context of “orientalized” architecture in the district proved most illuminating. Frequent anecdotes from his life growing up in Chinatown added color and richness to our experience. Morgan-designed buildings in Chinatown were the Chinese YWCA (now home to the Chinese Historical Society of America), the YWCA Residence and Gum Moon House. We gathered at the former YWCA in the morning for a brief introduction to our subject, before hitting the streets. Mr. Choy was able to gain access for us at least to the “public” interiors of the Y Residence and Gum Moon, as well. Of course, the tour’s scope took in the larger Chinatown context, and Mr. Choy pointed out Morgan’s skill in her allusions and references to a “Chinese style” architecture, more subtle and true than the colorful and exotic tourist-oriented Chinatown that emerged from the ruins of 1906. A fine dim sum at mid-day gave us strength to keep up with Phil’s vigorous pace, and a visit to a Taoist temple later in the day was an unexpected pleasure.